It's been one month since the Netflix series 'Tidying Up with Marie Kondo' made its debut and the Japanese organizational guru has inspired thousands around the globe. In Toronto, it's contributed to an increase in thrift store donations and in happiness for those who have followed the de-cluttering techniques. Organizing, folding and tidying have certainly 'sparked joy' for Torontonian Natalie Taylor. 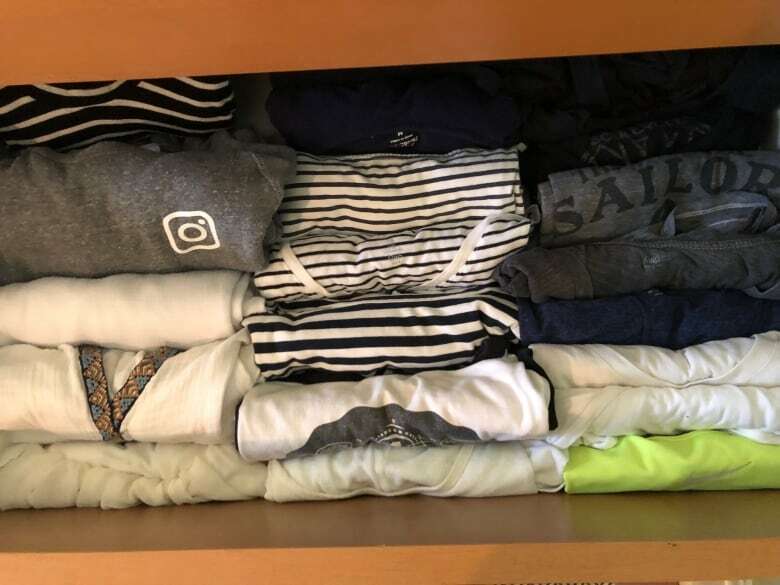 She says she was first intrigued by Marie Kondo after her book — The Life-Changing Magic of Tidying Up — was gaining attention, and has since applied those methods throughout the last three years. "I had a lot of stuff and I wanted to minimize and it just seemed like it was really working," Taylor said. In the process of de-cluttering the writer says she's ditched up to 200 books and multiple bags of clothing. It's also changed the way she shops. "I really scrutinize an item when I go shopping and I pick it up and I ask myself if it's really going to make me happy or if I really need it," Taylor said. "I realize just how many things I was buying that I didn't need or wasn't using." "It transferred over to my relationships," Taylor said. "I got rid of a ton of relationships and now I only find myself with people who make me happy." Taylor is not alone — Kondo's core teaching of only holding on to things that make you happy has resulted in people selling off their unwanted items online, and driving down to their local thrift stores to unload. At the three consignment stores that Nicole Babin owns across Toronto — she's noticed an increase in the number of people coming in ready to purge their unwanted clothing. Babin says some people visiting her Common Sort locations end up discussing amongst each other that Kondo was the source of inspiration to try and sell off used clothing. "Customers are talking about it to each other when they come in as well," Babin said. "Some of them say 'I went through my closet for the very first time and now I'm like getting rid of all this stuff.'" Babin isn't complaining — the 'Konverts' have brought some new faces into her store as well. "We've noticed a lot of new sellers coming in from the suburbs and further away because they've realized they need to clean out their items and they've found us." The business owner adds that she doesn't mind being the curator of the clutter. In a world of fast fashion, she thinks giving clothing a second or third life is a way to be more environmentally conscious. "I encourage people to come in and clean out their closets." Ivanka Siolkowsky has turned her organizational skills into a full time job. She's trained as a KonMari consultant — one of only 15 in Canada. She expects that number to boom as the trend continues to grow, but she's not concerned it'll impact her business, The Tidy Moose. "Everyone has stuff and everyone could use the help," Siolkowsky said. She completed the first training course in New York City with around 50 other participants and ended up making a full career change from her role as an elementary school teacher. She says she believes in Kondo's methods because they've also worked for her. "I've implemented all of them myself into my life and my life has become so much easier," Siolkowsky said. "Everything in my home has a place of its own, so I'm never running around looking for something." She says the part of the job she loves, is also making her client's lives easier. Some of them have told her that de-cluttering saved their marriages, helped them spend more time with their kids and made them feel generally happier. "Every time I arrive the clients are stressed out, and every single time I leave, they're beaming with smiles," she said. "You can almost see the weight that's been lifted off their shoulders."